Walking Dead spoilers below. Or should I say “spoil-roars.” No, I shouldn’t say that. Season 5 of The Walking Dead brought Rick and his group to Alexandria, one of the comic series’ greatest locations, and also managed to loop Morgan back into the mix, while introducing a brand new threat-group that dub themselves the Wolves. But screw wolves, for Robert Kirkman might be bringing an entirely different kind of beast to the show, as he is optimistic that the comic’s tiger Shiva may be making a future appearance. If we meet any characters name Siegfried and Roy, we’ll know for sure. It will still presumably be a long while until Shiva would be introduced into this increasingly madcap storyline, given she doesn’t appear in the comics until after Negan appears and makes life for Alexandrians a living hell. But the fact that Kirkman and showrunner Scott Gimple are even keeping that option open is kind of mind-blowing. Here’s how Kirkman explained it to Polygon. There's a guy who has a tiger for a pet in the comic named Ezekiel who's really cool. I always say that I never let the show influence what I'm doing in the comic. But I will say, when I was writing those characters in the comic, I was like, 'Yeah, good luck doing this, show people!' I think that we'll be able to do the tiger. We'll see. It’s incredible that the show is now at a point, both from creative and popularity angles, that Kirkman and Gimple can pretty much do whatever they want and AMC wouldn’t make the slightest fuss. The main challenge, at least to me, would be mixing in a real-life animal in subdued scenes with something presumably computer-generated for more action-packed sequences. I mean, we’ve seen what performance-capture can do with Dawn of the Planet of the Apes, and even though the apes behaved and moved more like humans than tigers do, there’s some middle ground there to conquer. Especially if they don’t end up getting to it for another year or two, which would allow more precise planning and some upgrades in the technology. Kirkman namechecks another ratings monster in justifying possible Shiva’s presence in the world of The Walking Dead TV show. 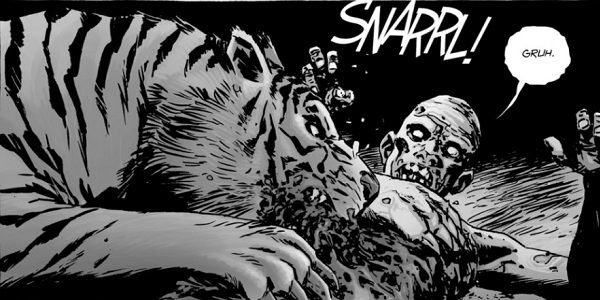 I’m like, ‘It would be awesome if there was a guy that had a pet tiger.’ Seeing a tiger eating zombies and stuff. But I think we can do a tiger on the show. Game of Thrones had people fighting bears in arenas, so I think we can do some tiger stuff. Just imagine how insanely disgusting (and amazing) watching this comic moment would be. We’ll have to wait and see how far into the comics Season 6 takes Rick & Co. before we’ll know when Shiva might rear her beautiful head. But one thing’s for sure, it’ll be gr-r-r-eat!